For more than a century, an immigrant from France has stood vigil in the New York Harbor. At 350 feet tall, with a majestic spiked crown upon her head, a tablet of laws clutched in one hand and a torch held aloft in the other, the lady is hard to miss. She cries out to the world, “Give me your tired, your poor…I lift my lamp beside the golden door!” Millions of immigrants have answered the Statue of Liberty’s call, passing over, under, or through the Golden Door to become Americans. However, on the eve of its 250th birthday, the United States is in the middle of an identity crisis. Should this land of immigrants welcome outsiders, people hungry for opportunity and desperate for freedom? Or should the country shut its golden door, barring entry to all but a select few? What exactly does it mean to be an American? How citizens answer these questions in the early twenty-first century will determine the future of America’s identity. 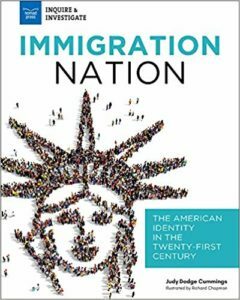 Immigration Nation includes critical-thinking activities and research exercises to encourage readers ages 12-15 to explore the past, present, and future of immigration from the viewpoints of immigrants, citizens, and policy makers as they wrestle with what it means to be an American in the 21st century.